Through the years, the graphical aspect has always been my favorite part of web design. That's why I've started a service for these types of design efforts. I have a good bit of experience in promotional poster design (concerts, events, etc.) and have posted pricing below. 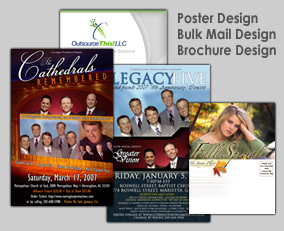 I also have experience in brochure and bulk mail design (postcards) as well. I welcome any ideas you may have for layout. Just shoot me an email about what you're looking for and I'll get a price quote right back to you. Please email for price quotes on other items such as brochures.